Esri delivered draft GeoPackage support in ArcGIS 10.2.1 for Desktop that shipped at the end of 2013. 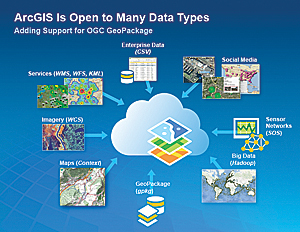 In summer 2014, ArcGIS 10.3 for Desktop will add platforms and deployment options based on 1.0 vector and tiled raster specification for OGC GeoPackage, and ArcGIS Runtime10.2.4 for Android and Java will also support GeoPackage. The OGC Encoding Standard defines GeoPackage for exchange and GeoPackage SQLite Extensions for direct use of vector geospatial features and/or tile matrix sets of earth images and raster maps at various scales. Direct use means the ability to access and update data in a native storage format without intermediate format translations. This guarantees data model and dataset integrity and identical access and update results in response to identical requests from different client applications. GeoPackage is interoperable across common enterprise and personal computing environments and may be particularly useful on mobile devices like cell phones and tablets in communications environments with limited connectivity and bandwidth. Esri’s open-source data streaming and transformation technology koop supports exporting to GeoPackage. For more information on koop, visit esri.github.io. For more information, contact Keith Ryden, Esri.